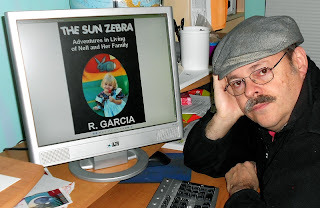 Today we have author Rolando Garcia here to talk about his book, The Sun Zebra. So Rolando, please tell us about The Sun Zebra. 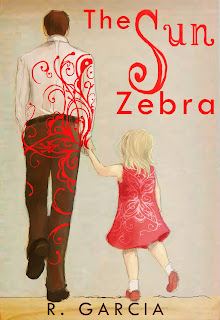 I describe my first book, The Sun Zebra, as a “children’s book for grownups”. It’s a collection of family-friendly stories about the "adventures in living" of an unusual little girl named Nell, her mother, Rhonda, and Nell's father who is the narrator of the stories. The stories deal with how the world of adults and its hard realities intersects with the magical carefree world of children. The purpose of these stories is to help us discover or rediscover what it is to see the world through the eyes of a child. Many things can inspire my writing like a picture, a landscape, something I read, an experience, a face, etc. I like to think that I have several muses who are constantly seeking my attention individually or in groups. That is why I describe myself as the peculiar eclectic writer. I have known that I wanted to be a writer since my college years. 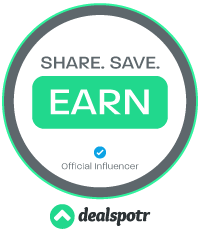 I always had a need to express myself through writing, but I never got around to pursuing it seriously until a couple of years ago when I started posting my work on the document-sharing site Scribd.com. Within a two year period my documents gathered more than 100,000 reads and hundreds of comments. It was this enthusiastic reaction that convinced me to publish my e-book. I haven’t written a novel yet, and all beginning writers should probably avoid writing one until they have written several hundred short stories. This is because, as Ray Bradbury says, if you write a novel and it is bad you have just wasted a huge amount of your time. But if you write several short stories it is less likely that all of them will be bad, and you will have something to show for your work. The hardest part of writing is figuring out what happens next. I start my stories with a broad outline of what the story is about and its punch line; the bare bones if you will. But it is difficult to insert the flesh; to work out the details. My writing ritual is that I think about the story as much as possible. I try to “feel” my way around it before writing it. Beginning a story for me is like walking on the frozen surface of a lake. I need to make sure the ice is thick enough to hold my weight before I start walking (writing). I have written dozens of stories that are very different from the ones in my current book The Sun Zebra. I am currently trying to find a way to corral several of them together under a common theme for publication. My advice to aspiring writers is that they should realize that each of them is unique. What works for one writer won’t work for the next. Each writer must find his or her own way. Among the English-speaking writers I like Tolkien, J.K. Rowling, Isaac Asimov, Ray Bradbury, Stephen King, Dan Simmons, Edgar Alan Poe, and H.P. Lovecraft. Among the Spanish-speaking ones I like Horacio Quiroga, Jorge Luis Borges, and Gabriel Garcia Marques. Among my favorite books are The Lord of the Rings, The Harry Potter Series, The Hyperion Cantos, The Foundation Series, and One Hundred Years of Solitude. Nowadays I mostly read self-published e-books. Among the ones I’ve read are First Kiss by Barbara Alfaro, Shades of Love by Sunny Lockwood, Finding Clarity by Laura Novak, Iona Portal by Robert David McNeil, Hippie Boy by Ingrid Ricks, and Manhasset Stories by Suzanne McLain Rosenwasser. Many of my readers are surprised to find out that my first language is not English. I was born in a Caribbean island and spent my youth living in several Latin American countries before I came to the United States. I also have no formal training in English literature beyond the classes I took in American and British schools. But I did perfect my writing with the publication of several articles in technical journals while pursuing a career in a scientific discipline. In my mind now I have the synthesis of both English and Spanish literary traditions as well as the merging of the humanistic and scientific cultures. I hope that a lot of good stories come out of that, and that my readers will like them. So far my first book of short stories has been very well received and I have had many enthusiastic reviews. I am optimistic this trend will continue. Thank you Rolando for visiting us today! Happy writing! Excellent interview, Freda. I enjoyed the conversational style of this one. The book sounds intriguing, and the cover is fabulous.